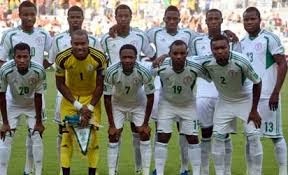 The Nigeria Football Federation on Thursday handed players of the Super Eagles a code of conduct that they are expected to abide to at the 2014 FIFA World Cup in Brazil. It is an 18-page document that outlined rules and regulations which the Super Eagles are expected not to go against at major events involving the national team. Former Sports minister Mallam Bolaji Abdullahi,championed the call for a code conduct,after the Super Eagles players threatened to boycott the 2013 FIFA Confederations Cup over the the slashing of their match bonuses. President of the NFF,Aminu Maigari in the company of Chairman of the technical committee,Chris Green presented the documents to Team Adminstrator, Dayo Enebi Achor,whoin turn passed it on the players. “The document is done in good faith and to ensure that players and officials know their obligations and how to properly conduct themselves, while the NFF will ensure that it also fulfills its own part of the bargain during major tournaments”, Maigari is quoted as saying on Vanguard Sports. Question is: will our players maintain discipline on and off the pitch in Brazil?